Winter is a fabulous time to sneak away for some relaxation with a best gal pal or two. After the holiday shopping and party frenzy, an all-girls holiday can provide a fresh start to a new year. As a Vancouver resident who recently ducked out for a staycation in my hometown with a travel blogging pal, here’s why I recommend you choose a Vancouver girlfriend getaway this winter. Vancouver’s temperate coastal weather can provide relief to visitors hailing from snowier locales in Canada, the U.S., and beyond. (Average high temps hover in the 40s Farenheit in winter.) From dining and shopping to hiking and skating, there’s lots to do both indoors and out to keep ladies busy. Foodies rejoice, the annual Dine Out Vancouver event takes place January 17-February 2, featuring hundreds of participating restaurants. It is the tastiest part of winter in this food-loving town. If you love the Soarin’ over California ride at Disneyland or Soarin’ at Epcot, you’ll really enjoy this new Vancouver attraction, Flyover Canada. This virtual flight-simulation lifts off for an 8-minute, breathtaking ride over the country. It can become quite intense when scenes change and you’re suddenly hanging over a mountain peak, but I found that just closing my eyes helped with any vertigo sensations. 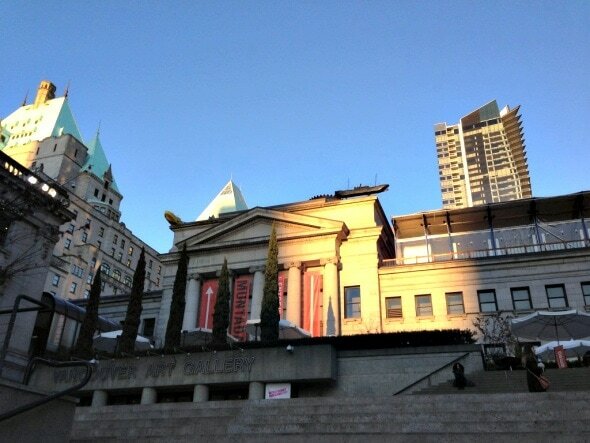 For a culture fix, the Vancouver Art Gallery (VAG), sits conveniently in the middle of downtown. Check your coat and wander among the galleries of First Nations sculptures, Emily Carr landscapes, and rotating visiting exhibitions. 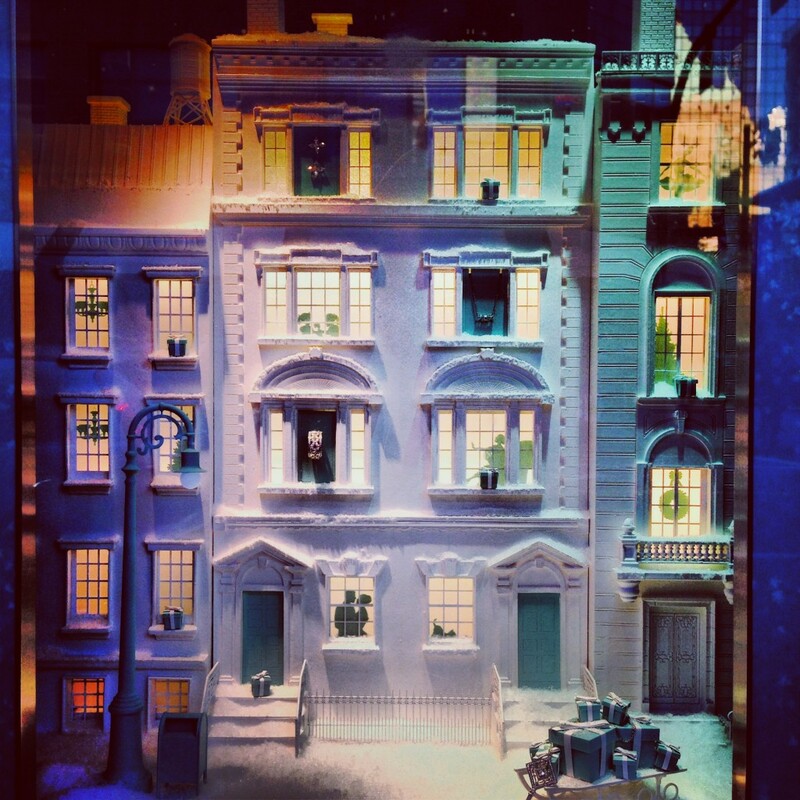 The Gallery Store is a real find; it’s the perfect place to find unique gifts and souvenirs of your visit. You can work off your eggs bennie (practically the national brunch dish) with a skate at the Robson Square Skating Rink. Located just steps from the Vancouver Art Gallery, here’s where to go for a few refreshing laps on the ice. The rink is open for a limited time each winter. Skate rentals are available on-site. Shopping is all around you in downtown Vancouver. The multi-story Hudson’s Bay store and Pacific Centre Mall are linked through an underground passage if you need to escape cold or rainy weather. High-end, on-street shopping can be found nearby along Burrard, Alberni and Robson Streets. The Gastown neighborhood is home to some fantastic independent clothing and home decor retailers. Some of my faves include Orling & Wu, Parliament, and Fluevog Shoes. It’s worth the short 10-minute walk from the downtown core to explore this oldest and hippest Vancouver neighborhood. If you’re up for a bit of outdoor snow play, venture across the Lions Gate Bridge and head up the gondola to Grouse Mountain. 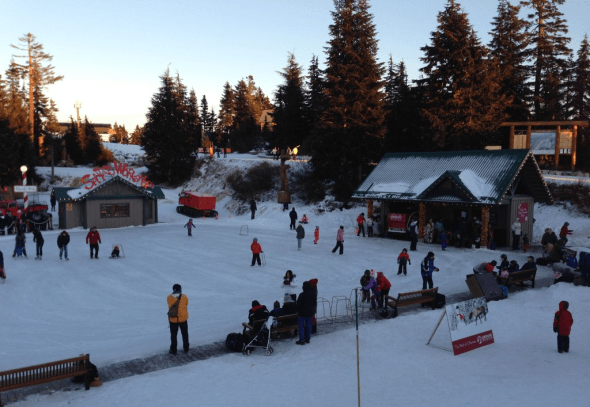 Grouse is one of three local ski hills north of Vancouver, and the only one you can’t drive up. You can go snowshoeing in the snow-covered forest, ski or snowboard with a view of the city, ice skate on the frozen pond, or simply enjoy some hot chocolate and nachos in the Altitudes Bistro. On the way to (or from) Grouse you will find the Capilano Suspension Bridge Park, a local tourist draw since 1889. The Park features interactive First Nations totems and historical displays, the hair-raising Cliffwalk attraction, Treetops Adventure, and, of course, the swaying Suspension Bridge over the Capilano River. If you’re afraid of heights (like me) you might prefer to visit in the dark, when you can’t actually see how far above you are from the riverbed. There is a free shuttle to the park from several downtown Vancouver hotels (tickets must be purchased in advance). A girl’s got to eat, and the Dine Out Vancouver Festival is the perfect event to meet your every foodie desire. Each mid-January to early February, there are 17 days of culinary events and adventures involving hundreds of the city’s best restaurants. Each participating restaurant offers a three- (or more) course dinner at one of three different price points: $18, $28 or $38 (Cdn). You can choose a restaurant based on price, neighborhood, style and cuisine. Reservations are strongly recommended. Special Dine Out Vancouver event tickets – to Secret Supper Soiree, East Van Craft Brew Tour, etc – are on sale now. Other great dining options around town include La Pentola della Quercia (Yaletown), Cactus Club (multiple locations), the Parker, Bao Bei (Chinatown) Hawksworth, Yew, Oru and Italian Kitchen (all downtown), Wildebeest (Downtown Eastside), Meat & Bread, Abattoir (both Gastown), and Maenam (Kitsilano). Vancouver is blessed with many world-class hotels. 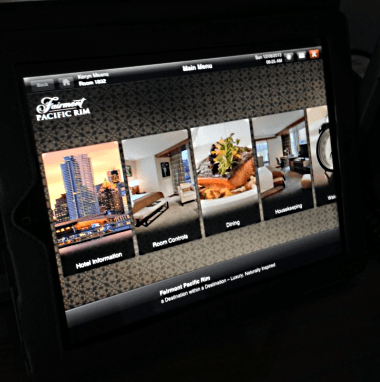 One of the finest and best located is the Fairmont Pacific Rim Hotel. The newest of three downtown Fairmont hotels, the Pacific Rim is luxurious and modern, with spectacular views of the north shore mountains and Burrard Inlet. The hotel offers a Beauty Sleep Package that includes your stay, two spa treatments and full spa access, a bottle of sparkling wine and breakfast in bed—ideal for a Vancouver girlfriend getaway! 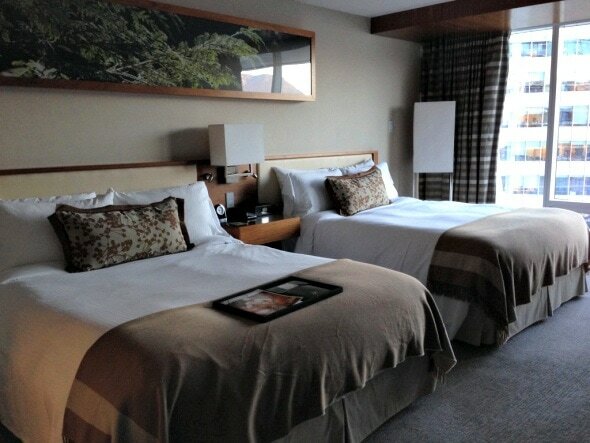 The hotel suites are spacious, with super comfortable queen or king beds. There’s even a TV in the mirror in the spa-like in-suite bathroom. Everything is very modern, including the lighting system that you can adjust to fit your mood: relaxed, spa, grooming. The drapes are also controlled by this electronic system, which can appear confusing at first, but is actually quite easy to use once you get the hang of it. The Fairmont Pacific Rim Hotel has a bustling Lobby Lounge that attracts guests and locals for their exclusive cocktails, sushi and snacks. Come here to people watch, listen to live music, and just relax while enjoying a delicious ‘Check In’ martini. For casual breakfast, lunch or coffee, the cozy Giovane Cafe is accessible from the hotel lobby. Giovane offers a wide selection of baked goods, sandwiches, espresso drinks and a fabulous candy bar. Also sweet and not to be missed is Bella Gelateria, the award-winning, best gelato in town. Forget the weather and transport yourself to Italy with some chocolate and salted caramel gelato. Delicioso! A girls weekend is not complete without some pampering spa time. The Willow Stream Spa at the Pacific Rim is a calm oasis of relaxation. 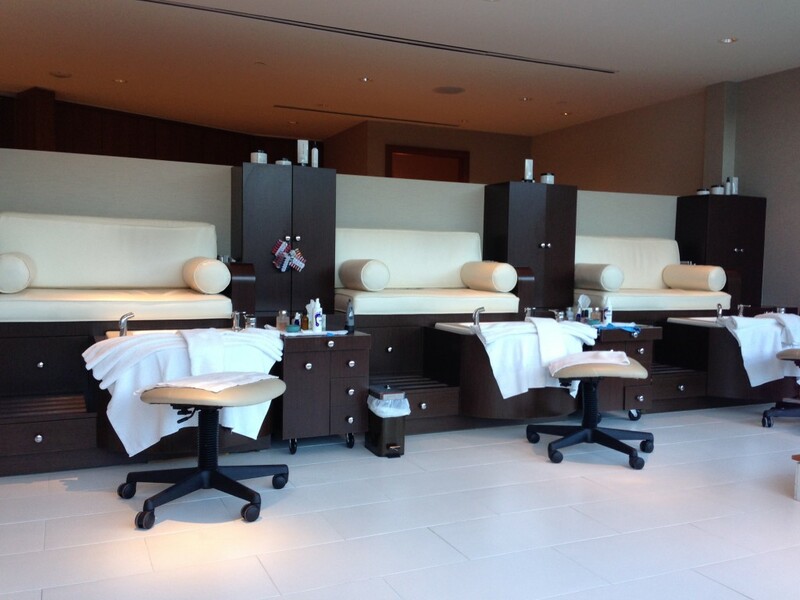 The extensive spa menu offers body treatments, manicures/pedicures, massages, and facials. The maple sugar scrub treatment sounds positively edible. There are several outdoor hot tubs, a pool, eucalyptus steam room, sauna, hydrotherapy shower, and a ladies-only lounge area with a selection of teas, fruit, and flavored water. On the same floor exercise fanatics can access the yoga studio (which offers classes twice per week) and fitness room. Bonding in Vancouver with your BFF over pedis, a lovely meal or while window-shopping is just the ticket to recharge for the busy new year, and keep the winter blues away. Would you consider taking a winter Vancouver girlfriend getaway? Let us know in the comments below! The Curious Travel Mama visited these attractions as a guest of Tourism Vancouver and the Fairmont Pacific Rim Hotel. As always, our opinions are honest and our own. Vancouver is a fabulous city. I’ve only been there twice and didn’t have enough time to see the many places many mentioned in this story. I intend to return. Thanks for your comment Ellen. Glad to hear that you’re planning a return visit to our fair city. There is so much to discover in and around the city!